Penang and Melaka both enjoy enviable strategic positions. If you want to sail from India to China, you have to go through the Melaka Straits on the west side of the Malaysian peninsula, unless you want to go around Sumatra, adding hundreds of miles to the journey. So the strait is a good place to set up a trading post, with access to the markets of India, China, Vietnam, Siam and Java, and the jungle products of Borneo and Sumatra. Penang was an English development. In the eighteenth century the island, at the northern entrance to the Melaka Straits, was very sparsely populated. Capt Francis Light thought it would be an ideal place to built a staging post for English ships sailing between India and China (England controlled the silk trade at the time). He obtained permission from the sultan to build a base there. Capt Light hired some locals to build a fort at the point where he first landed, in 1786. It was the East India Company’s first base in the region. 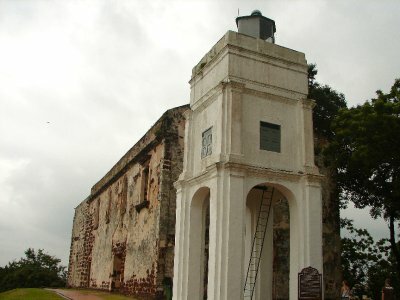 The first version of the fort was built, in 1793, in palm. Light named the fort after Cornwallis, the Governor-General of India, best known now as the man who surrendered at Yorktown. 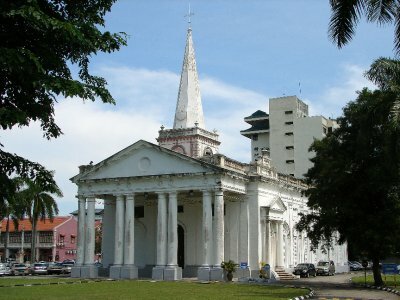 Around it grew George Town, now the capital of Penang. 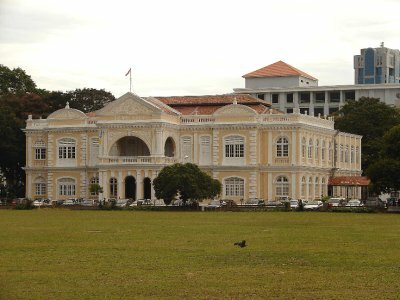 It is now a city rather than a town, but a few monumental buildings of the colonial era - the town hall, city hall, the museum, and Fort Cornwallis - survive. This is St George’s church, built in 1818. 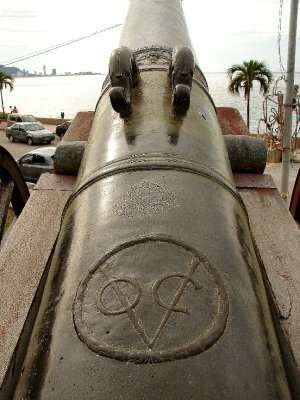 An old cannon, cast by the VOC, points over the walls of the fort. Local women now visit it to pray for fertility. It is a hefty cannon. 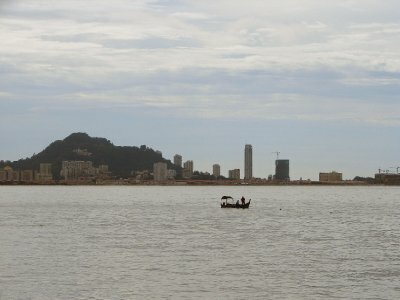 Penang, like those other trading towns Melaka and Singapore, has a large Chinese population. As in those cities, Chinese immigrants formed themselves into families or clans. 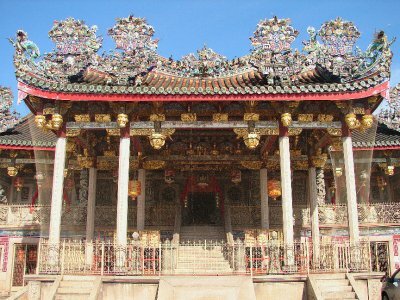 Each clan had a kongsi, a building where people could meet; also a temple. 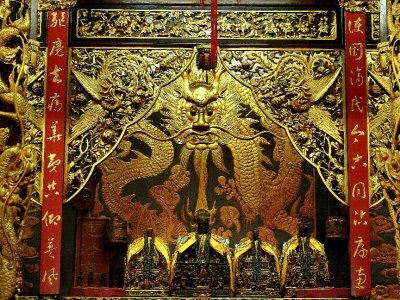 In Penang, for example, there is a temple, built in 1924, for the ancestral deities of the Yap clan, originally from Fujian. It is guarded by lions, of course. The clan has 700 members in Penang. 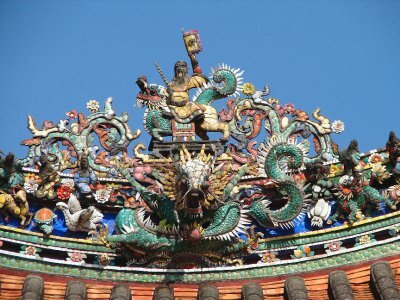 The Yap name dates from 439 BC, when Shen Zhu Liang defeated the Qin army and helped to restore the Chu dynasty. He was awarded a title and a piece of land called Yap district, so he took Yap as his surname. Rather like the Windsors. 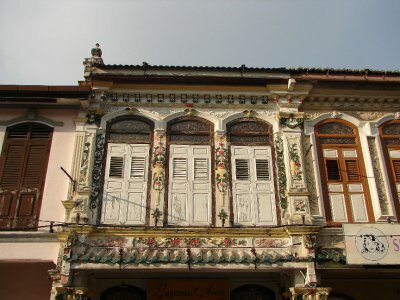 The Khoo clan also has a kongsi, the largest and finest in the city. In the central hall are some lovely pictures. 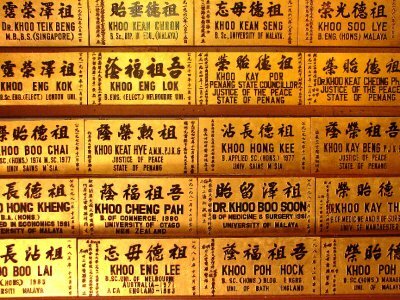 Next to the central hall of the Khoo temple are two halls of fame. Any Khoo with a foreign qualification gets a shiny board on the wall; there are quite a few Khoos at Middle Temple, which is my Inn, and one or two at the other Inns of Court. There are other Buddhist temples in town, too: a Thai one and a Burmese one. 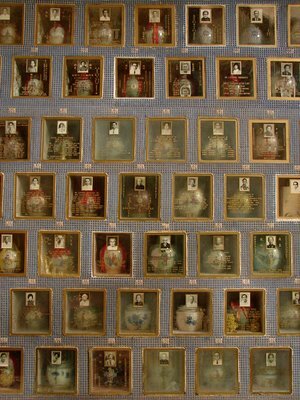 This is a columbarium at the Wat Chaiyamangkalaran. 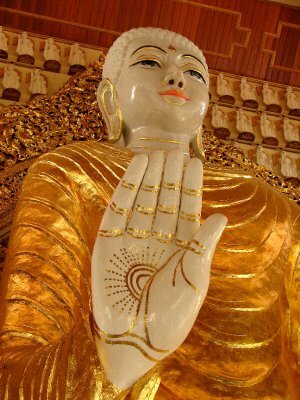 And here is the Buddha at the Burmese temple. 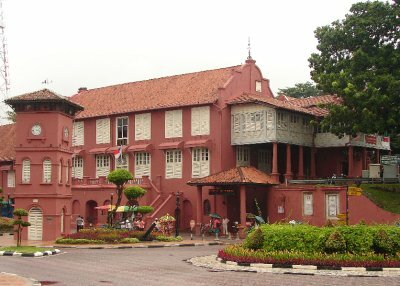 George Town and Melaka are the two “Historic Cities of the Straits of Melaka”, which recently obtained a World Heritage Listing. 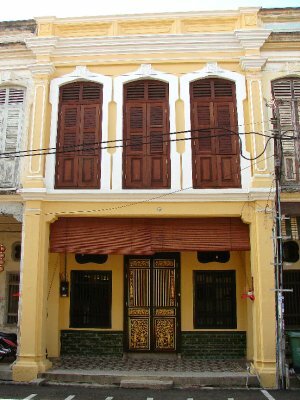 The reason they are historic is that they have a lot of old shophouses. 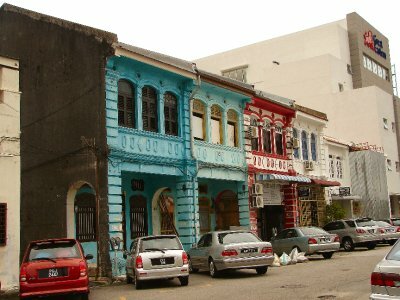 (The style is not unique to Penang and Melaka. There are a fair number in Kuala Terengganu, and some in Kota Bahru, as well as in Singapore.) But Penang has 1,700 of them. 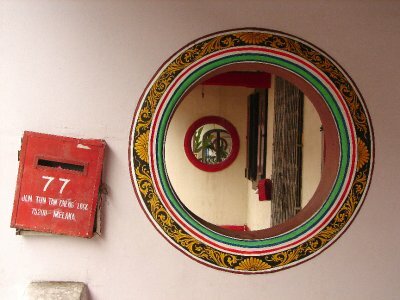 The style is said to mix Portuguese, Dutch, Malay and Chinese influences. I could not discern anything Portuguese. 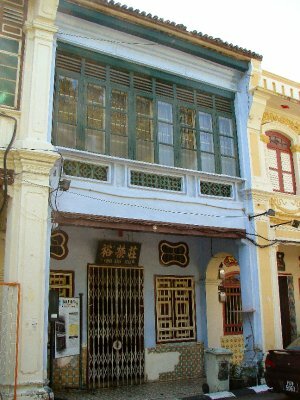 Shophouses are two-storey trading houses, the ground floor open to the street. 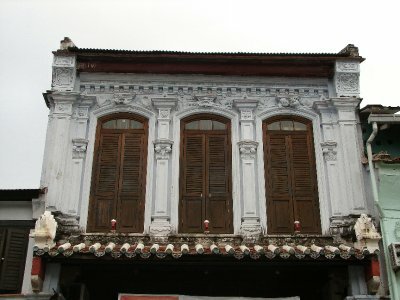 They are built on a simple plan with a rather plain façade, introduced by the Dutch, with more elaborate motifs coming from Malay and Chinese styles. As in Vietnam, the plot is long and thin. The living quarters and the kitchens are at the back, with an air-shaft in the middle. •	Early shophouse style, 1800-1850. Two-storey, built right on to the street edge with a recessed ground floor forming a pedestrian walkway. Usually simple and small in scale, the upper storeys sometimes no more than four feet high. The upper wall has continuous panelled or louvred shutters. The upper floor is timber and roof tiled. •	Early Transitional, 1840-1900s. Built with a five-foot pedestrian walkway. The balcony is simply decorated, eg glazed green vents. Tuscan or Doric pilasters. A continuous range of shutters above. •	Early Straits Eclectic, with glass in the shutters for the first time. The shutters are no longer continuous. The roof overhangs become wider after 1900, because of the availability of reinforced concrete. •	Late Straits Eclectic, 1920s-1940s, notable for spectacular ornamentation. Three windows, with very little wall space in between. Columns or pilasters of stucco, with Chinese panel frescoes. •	Neoclassical, influenced by Anglo-Indian architecture, high ceilings, large porches, portico, colonnade, cupola, strict classical orders. •	And finally there is some Art Deco from the 1930s to the 1950s. In George Town the buildings are used, in general, as they always were - as shops. In this respect George Town has the advantage over Melaka. It feels real. But Melaka, to the south, has the history. Unlike Penang, Melaka was an extremely wealthy and thriving port before the Europeans came. In fact it has the most interesting history of any town in the peninsula. Melaka is at the meeting point of the southeast and northeast monsoons. Merchants could wait in Melaka for the monsoon to change. Between April and October, the southeast monsoon blew ships towards China and Japan; between November and April, the northeast monsoon blew them back. 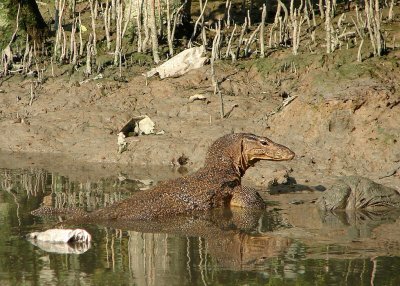 Melaka is on a river, home to huge water monitors, tiled like the Hôtel de Dieu in Beaune. We went on an enjoyable boat trip along the river and were regaled with entertaining but questionable history along the way. Dilapidated godowns still flank the river. The town was the base of the Melaka (Malacca) sultanate between 1400 and 1511. 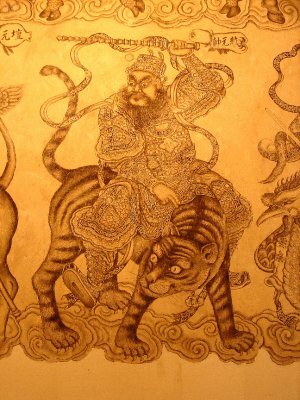 The founder was Parameswara, a Sriwijayan prince from Sumatra. He embraced Islam in 1414 and called himself Raja Iskander Shah. Like the conversions to Christianity in eastern Europe towards the end of the first millennium, this seems to have been a political decision: he needed allies. Islam then spread from Melaka throughout the Malay world. The Malay sultanate imposed a 6% ad valorem tax. Melaka was at its busiest between December and March, when ships from both west and east Asia arrived. Boats came from Java and the Spice Islands during the northern hemisphere summer. Traded in Melaka were especially textiles from India, commodities from east and west Africa, and Chinese silk and porcelain. Eighty-four languages were said to be spoken in Melaka. Zheng He stopped here several times in the early fifteenth century, and built a trading post – he may also have converted Iskander Shah - and there have been Peranakans (Chinese) here ever since Hang Li Po arrived in, perhaps, 1459 to marry Sultan Mansur Shah. From the Malay perspective, it was downhill after the Portuguese arrived. Vasco da Gama reached Calicut in 1498, where he heard about Melaka, and it took very little time for the Portuguese to discover the rest of Asia. 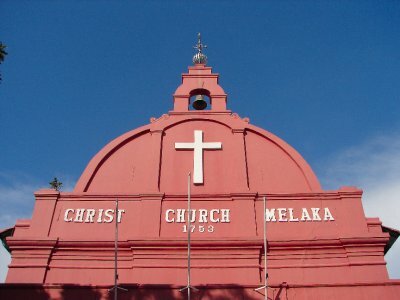 The Portuguese arrived in Melaka to trade in 1509 and conquered the town by force in 1511, initiating the process of European colonisation in southeast Asia. The sultanate moved elsewhere. Paradoxically, it was the Portuguese capture of Melaka that triggered the Islamisation of the entire region. The Dutch took the town in 1641 from the Portuguese after a siege. By then they had made Batavia the political and trading centre in the east, and they imposed heavy taxes on shipping in Melaka and diverted ships towards Batavia. In the late eighteenth century the Dutch had to retrench, because the country was occupied by the armies of France, and in 1795 the British moved in, effectively holding it on trust for the Dutch for the duration of the war. But, like the Russians in Georgia recently, the British blew up the Dutch fort, so that when the Dutch came back they would not be able to defend it. The Dutch never came back, though, and under the Treaty of London 1824 the British swapped Bercoolen (Benkulu) in Sumatra for Melaka. The British remained in Malaya until 1957, not counting the three years of Japanese occupation. They neglected Melaka, since Singapore was their commercial base in southeast Asia; Penang to the north was also more important. Certainly trade in Melaka diminished rapidly around the time Singapore was founded. 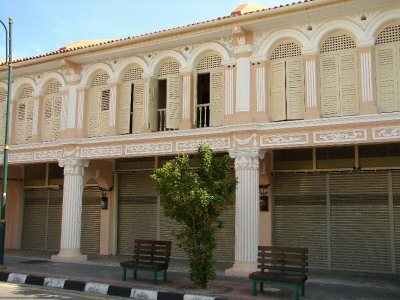 Melaka dwindled and became a small, dilapidated town. The estuary silted up. In the nineteenth century Melaka had to start focusing on agriculture, and became an exporter of green pepper and rubber, as well as livestock, rattan, timber, gold dust and fish. No-one after the Melaka sultanate made any money out of the place. 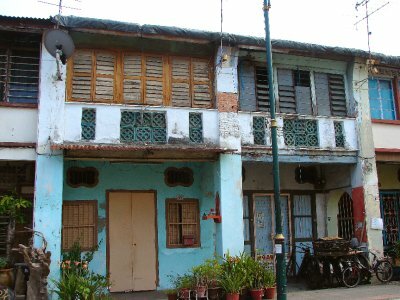 Melaka has the oldest buildings on the peninsula. In its original version, the church of St Paul’s dates from 1521, when it was called Nosa Senhora. It was enlarged and renamed after the Annunciation in 1556, and then renamed again and turned into a Protestant church by the Dutch. St Francis Xavier, who visited regularly, was buried here for nine months before his remnants were transferred to Goa. (There is a miracle associated with this if you are into that sort of thing.) A number of old Dutch gravestones remain. The Dutch built Christ Church opposite the Stadthuys in 1753, after which they stopped using St Paul’s, which fell into ruin. The pragmatical Brits used the church to store gunpowder. 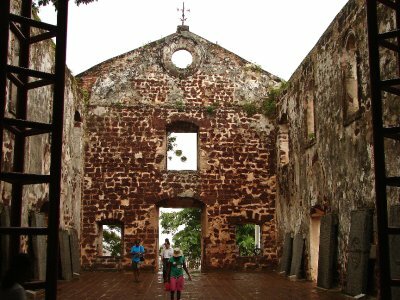 St Paul’s is faced, as the fort was, in laterite, which is a concentration of insoluble minerals resulting from erosion of rock by heavy rainfall and given its colour by iron oxides. The other old buildings of the town are painted dark red to mimic it. The Dutch also built the Stadthuys in 1660, which now houses a history museum, worth visiting if it is raining. 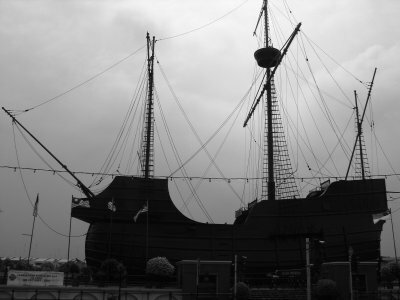 One interesting place to visit in Melaka is the Flora de la Mar, a 110-foot long replica of a Portuguese nau, fat and tall like a three-masted galleon, but less stable. The Flora de la Mar sank in January 1512 in the Straits of Malacca on her way to Europe. The replica was inaugurated as a maritime museum in 1994. What was the nationality of the first person to sail around the globe? Malay, perhaps. Ferdinand Magellan purchased Panglima Awang as a slave in Melaka in 1511, and he accompanied Magellan back to Europe. He was christened and named Enrique. Magellan then mounted an expedition to sail around the world, and Panglima Awang went along as interpreter. As I mentioned before, by the time the ships reached Cebu in 1521, Magellan was dead; but Panglima Awang had sailed around the world. 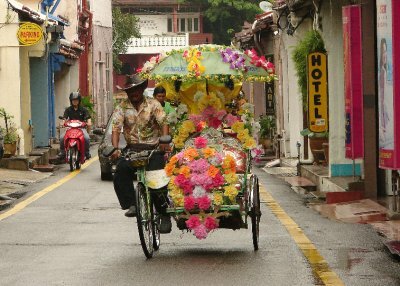 There are still quite a few trishaws, bedecked in flowers, in Melaka, but they are an expensive way to get around, catering solely for tourists. In Indonesia they remain an important medium of public transport in most places outside central Jakarta. The first floor overhangs the street by a few feet. In Penang and Singapore, the overhang is supported by pillars, and since the plots are contiguous this creates a sidewalk: a five-foot way. Since both commercial and family life takes place largely on this patch, it is not always possible to walk down it. 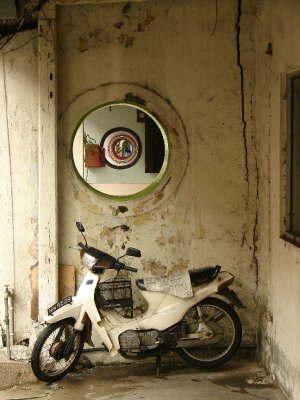 But in Melaka, for reasons that remain occult, the front patios are often separated by walls with portholes. The patios cannot be used as a path, so you have to walk in peril in the narrow streets, which carry heavy traffic. 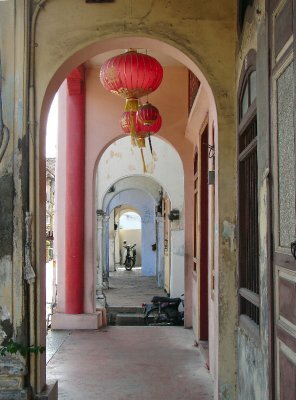 In Melaka, the five-foot ways are confined to a fairly small Chinatown area. Many of the premises are now given over to touristified souvenir shops and restaurants. 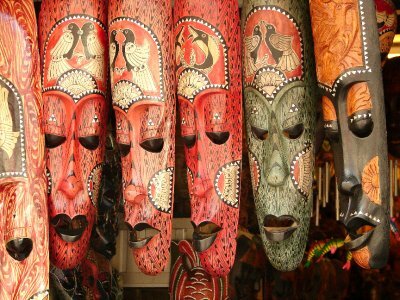 These masks are not Melakan. It’s less satisfactory than George Town or Singapore. Melaka has the most interesting history in Malaysia but perhaps the least interesting Chinatown. In any case, the place is worth visiting for the food alone. 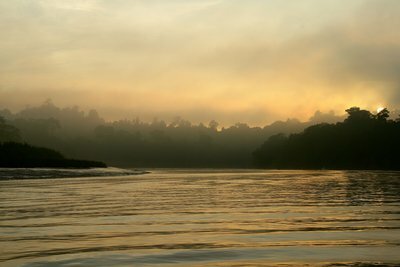 In July I spent a few days in the Kinabatangan valley. I have written about this in a previous entry, but my account contained an elephantine omission. 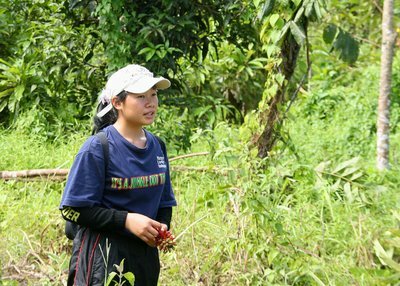 On our first daytime walk in the Kinabatangan valley, the guides were nervous. They knew that a group of wild elephants was nearby; in the group were two young elephants, and the mothers were apt to be protective. The guides were not nervous on their own behalf, since they knew how to avoid elephants, but on behalf of the clumsy unpredictable tourists, liable to do exactly the wrong thing at the wrong time. In the middle of the walk we duly hear a trumpeting coming from about twenty or thirty yards away. You can’t see twenty yards in the forest, so all we know is that we have met the elephants. The fanfare is very loud, very high and very sudden, and the overwhelming instinct of the majority of the group is to run. We have been clearly told not to, so the runners manage to stop after two or three strides when their forebrains regain control. We soon hear a very deep, leonine growling, with Dolby surround sound and big subwoofers. There is also a strong smell of elephant. The other sound is the cracking of branches. Indeed, sounds come from three directions. We walk on slowly and very cautiously. Every so often we catch a glimpse of elephant grey on our left; an elephant is walking parallel to our path. Then we see an elephant up ahead. It sees us too and walks away. 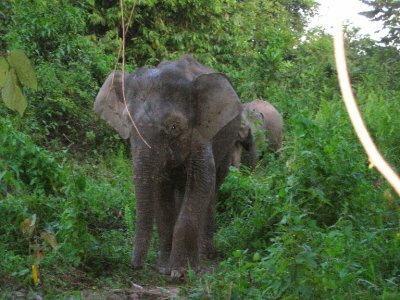 Then we spot an elephant on our right; it too walks off when it sees us, so the path is clear and we continue walking. Seeing wild elephants at a distance is far more thrilling than seeing domesticated elephants up close. The guides’ patent fear adds to the thrill; they know that the elephants are dangerous and their fear communicates itself to us. The Bornean pygmy elephant is a distinct sub-species, Elephas maximus borneensis, of the Asian elephant. It was confirmed as a sub-species in a study conducted at Columbia University, before which it was thought that the elephants had been transported to Borneo by man in recent times; actually it arrived tens of thousands of years ago. The pygmy elephant has larger ears than other Asian elephants. It is smaller, as its name suggests, but the epithet is harsh: adults stand 1.7-2.6m tall, and other Asian elephants 2.5-3m. 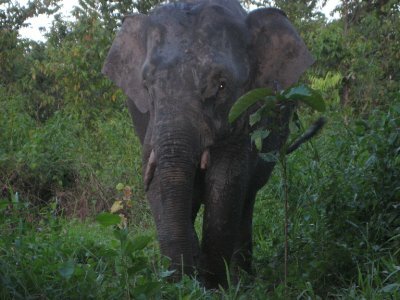 When you see a Bornean elephant it does not strike you as lacking stature. Males reach full size at around 25, and they can weigh three tonnes. They stay with the family group until they reach sexual maturity at around ten or twelve, at which point they are kicked out. 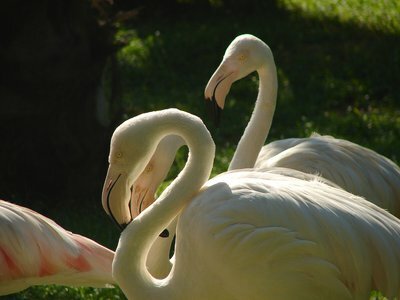 The others live in family groups of five to ten. A couple of days after that meeting we took a sunset boat trip, and Luis parked the boat at a part of the bank that looked much like any other. He told us to stay in the boat and disappeared for at least ten minutes. 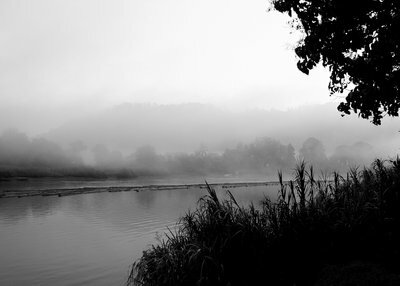 Then he returned, and motioned us to climb silently up the muddy bank. Using trees for cover, we peered out into a clearing and saw an adult feeding. Then a juvenile elephant walks straight past us. That is interesting, but not good. We are between the baby and its mother and aunts; they won’t be happy. Sure enough, mama walks up the path and trumpets, and we retreat as fast as we can. The mother sees us, trumpets again, and runs back. It is well known that elephants cannot jump, but she changes direction very quickly, pushing off with her forelegs like a deer. Then she walks very tentatively up the path and stares at us for a long time. We are all pretty tense, and ready to jump. Elephants do not understand sign language. The female very deliberately walked twenty yards away and started eating tall ferns while watching us. She kept up a low growling. Unfortunately, at this point two other boatloads of tourists arrived, attracted by the empty boat on the bank. They made a lot of noise and blocked our view. 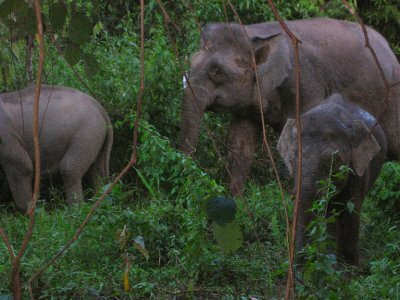 Three adult elephants arrived on the scene, with a tiny infant between them, and began to growl and trumpet. They made it very clear that they desired us to leave; it was a menacing moment. The guides told us to clear out and get on to the boat, and so we did. Then the first adult simply walked past us, and the baby followed. The two guides, free of worry about their defenceless charges, stayed on the bank and took photos of the baby, which the adults had left. The baby was thoroughly interested in the two guides. At one point it decided to charge – they can move very quickly – and Luis had to run down the bank. Mostly it turned its backside on Luis and walked backwards, hoping to run him down in reverse. This was the closest encounter we had, and it was I suppose inevitable that I managed to go out that afternoon without a memory card. These photos are, therefore, courtesy of Anna Östman and Rachel Seys. Luis took the close-ups. On my final evening in the lodge, I thought someone was breaking into the bathroom. There were loud cracks outside the hut. The lodge was surrounded by a fence, energetically electrified to keep the elephants out. My hut was right by the perimeter, and the elephants were just beyond the fence, so they were just a few yards away. I went out to check. I could not see a thing. I just heard spooky noises of breaking branches, five metres away. After supper we all walked to another part of the perimeter, where we could see a group feeding by the light of the moon. The most amazing thing: the violent cracking of large branches, which makes you realise the power at their disposal; and the loud growling, very deep indeed, which sounds like a large ferry engine. Indeed, it can be felt as much as heard, like the subsonic notes that precede an earthquake. 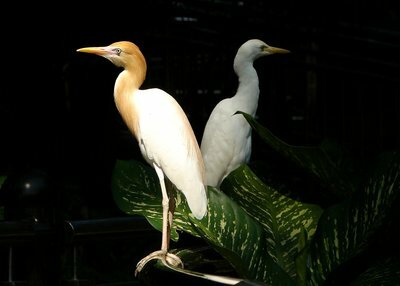 Four months ago I posted a batch of photos of the bird park in Kuala Lumpur, and then forgot about the rest. Here are the others, for my Aunt Jane. Be well. 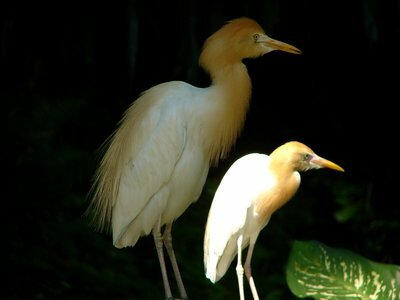 Cattle egrets. Wherever there are paddies, there are egrets. In July I spent a few happy days in the Kinabatangan valley in eastern Sabah. About 20,000 hectares of the valley is a wildlife sanctuary. Everyone knows that much of Borneo is rainforest. But most of it has previously been logged. There is very little primary forest left in Borneo, and much of the rest of the land is used for agriculture. Until recently cocoa – although first planted commercially only in the 1950s - was the dominant product. As cocoa prices fell through the floor (Bornean cocoa being markedly inferior to Ghanaian), most farmers switched to the African oil palm, although cocoa remains the fourth largest crop in Sabah. Rubber and copra are the other two important agricultural products. About a third of arable land in Sabah is planted with oil palms, so the oil palm is everywhere. It took several hours to get from Sandakan to Bilit, our base in the Kinabatangan, and we passed endless Cordoban Mezquitas of squat palms touching crown to crown. Between the branches grows a very large fruit, red-black like a blackberry but 10,000 times larger; it weighs up to 50 kg. It is picked with a sharp instrument on the end of a pole. It is a specialist job: get it wrong and the fruit kills you as it plummets towards the Earth’s centre of mass. Oil is extracted from the pulp and from the kernel. A hectare can yield 10 tonnes of fruit. The pulp (pericarp) oil is the most popular edible oil in the world. It is used mainly to make margarine and processed foods. The kernel oil is used to make soap and detergent. Some palm oil is nowadays used to make biodiesel. Malaysia is the biggest exporter of palm oil, but Indonesia is planning to double its production in the next few years, blithely saying goodbye to its forests and to the animal species that live in them. 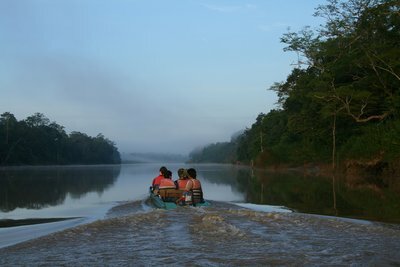 The Kinabatangan Wildlife Reserve is classed as secondary forest because it has been subject to logging, but not for a long time, and the forest seems (to a man from Lambeth) healthy with a wide variety of species. Two thirds of the animal and plant species of the world live in rainforests. The reserve is a mixed dipterocarp forest, an evergreen lowland forest. Dipterocarp is the predominant tree type in tropical rainforest, and most of the timber produced in Borneo is dipterocarp, including the hardwood. As its name implies, its fruit has wings. Most species have two, but some have more. Dipterocarps are tall trees. Some grow to 60 metres or more. Typically they have a reddish bark, and buttresses supporting the lower trunk. Their root systems are wide but very shallow, and the buttresses provide some added stability. Once we got to Bilit we took a little boat across the river and arrived at the lodge, a constellation of twenty-odd bamboo stilt huts together with two larger stilt buildings. There is a rolling guest list. Most stay for two nights, some for one night. A Japanese lady was staying for a week. I stayed for three nights, I think. 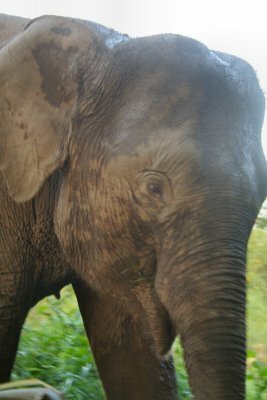 I wanted to see proboscis monkeys and Bornean pygmy elephants and was lucky enough to see both. The routine was the same every day. 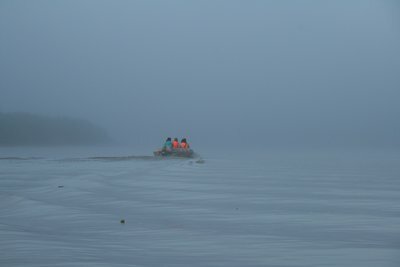 Up at dawn for a two-hour cruise in small motorised canoes, accompanied by a sharp-eyed guide a morning walk to a nearby oxbow lake; an afternoon off, an evening cruise along the river and a night-time walk. 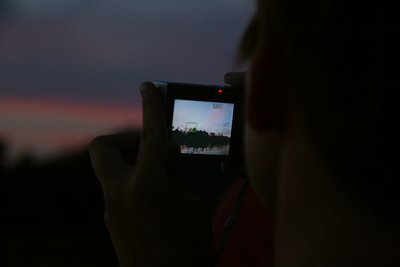 It did not become monotonous because you see different things each time. Here is a stick insect at the oxbow lake. 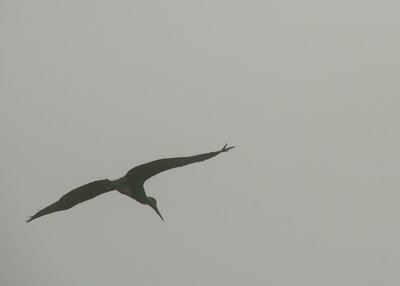 Lines of sight along the river are much greater than in the forest, so it is easy to see birds. 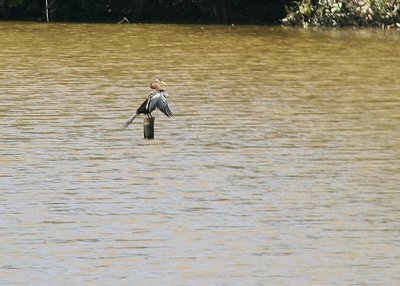 The oriental darter, a big bird with a long neck, large wings and a sharp beak, dives for up to a minute. It often surfaces slowly, puts its head up like a periscope, and then sinks again. Then it looks a lot like a water snake. Malaysia has fifteen species of kingfisher; Europe has one. 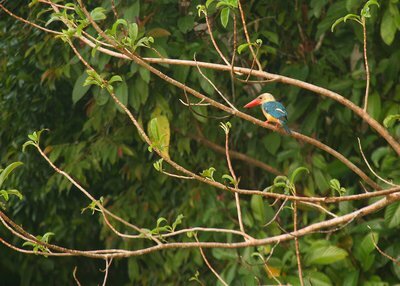 Posted at regular intervals along the bank is the stork-billed kingfisher. Malaysia’s largest, it grows over a foot tall. It is territorial and will attack any other bird. 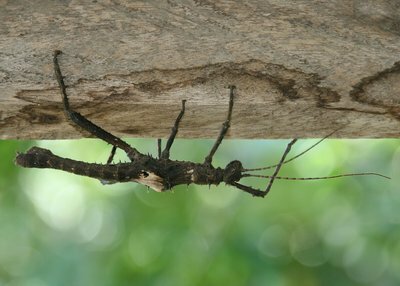 They eat anything that moves, including crabs, lizards, frogs and spiders. 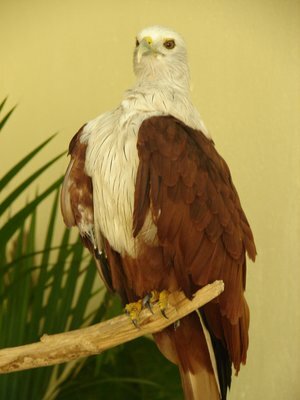 The Brahminy kite, which grows to 45 cm, is found from India to the Solomon Islands. It lives along the rivers, and especially along the coasts. 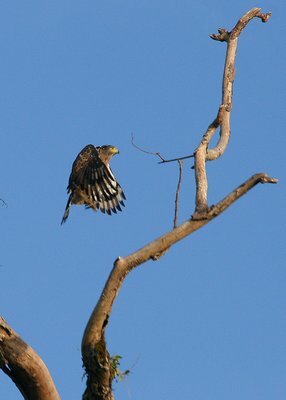 The crested serpent eagle, which grows to 48 cm, lives in almost every environment in Sabah from the coasts to the mountains. They eat reptiles, large birds, rodents and large invertebrates. They are common along the river. Also very common along the banks are dollar birds. Here and there secure nests with small entrances are constructed on vertical shaft sticking out of the river itself; these are black and red broadbills, with a bold azure bill. 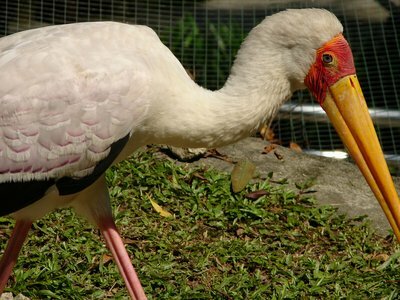 Storm’s stork is a very rare bird. 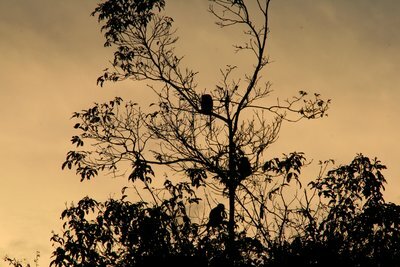 Birdwatchers travel to the Kinabatangan to see it. There are only 500 or so left. 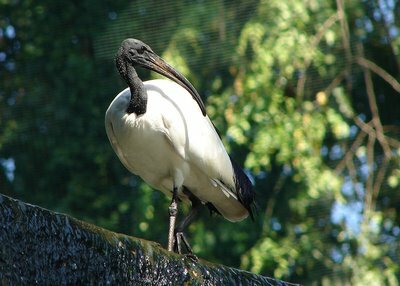 It’s a handsome black and white stork with a red bill. Great egrets line the banks, probably the most numerous bird. 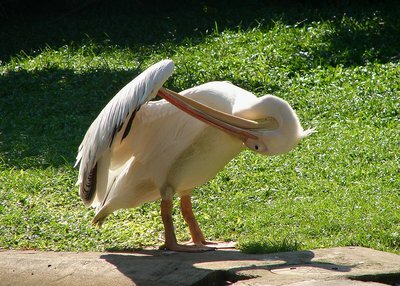 They fly with their necks folded back. On our first river cruise we saw a large male orang utan with cheek pouches, sitting in the fork of a tree, picking and eating figs very slowly. 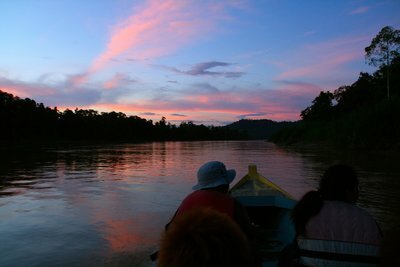 There are twenty species of fig in Kinabatangan, five hundred in Borneo. Ficus rasemosa is especially important, since all the arboreal animals eat the fruit and/or the leaves. Even the pigs get to benefit, since the long-tail macaques are messy eaters. 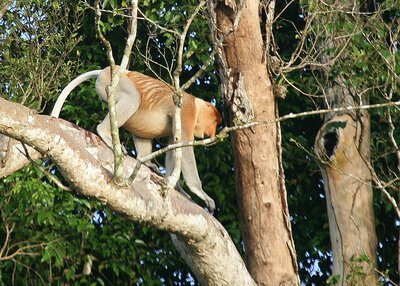 Occasionally we would see proboscis monkeys, Nasalis larvatus. 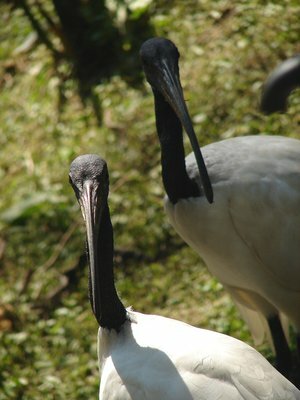 Endemic to Borneo, they live along river banks, in mangroves and in peatswamp forests. Being arboreal, they are losing places to live; there may be only 8,000 of them left. But they are easy to see because they like to collect in trees by the riverbank. They must be one of the weirdest-looking mammals. They are orange-red over most of the body but the limbs, tail and collar are silvery-white, and they seem to be wearing white nappies. 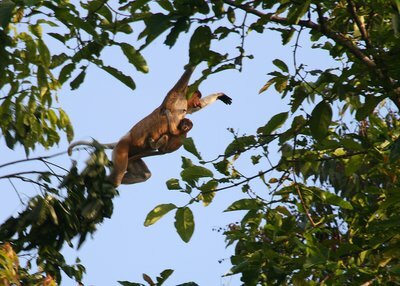 Young proboscis monkeys have dark blue faces. A local name for them is orang Belanda: Dutchmen. They also have incongruous tellytubby bellies. They live on unripe fruit, seeds, and leaves. Some of this diet is poisonous. They have two stomachs: the first contains special flora to digest the toxins, and the second acts as a normal gut. A side-effect of this digestive set-up is that they cannot digest ripe fruit. It also produces gas in volume, hence the beer gut. 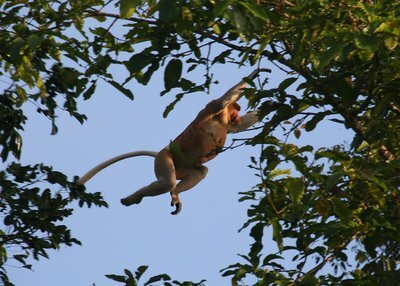 Despite their build they are extremely agile, and they leap great distances from tree to tree. They are also good swimmers, sometimes swimming in the open sea. 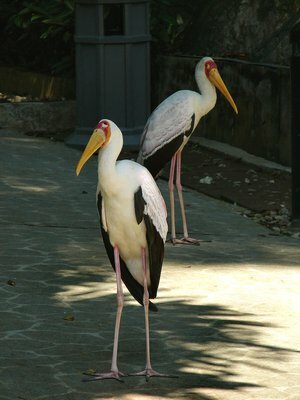 They walk upright when wading, with the females carrying infants on their hips. 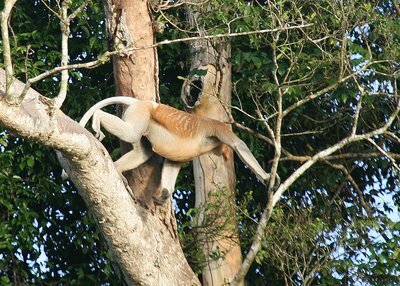 Other than humans, only proboscis monkeys, gibbons and pangolins are known to walk bipedally for any length of time. And then there is the nose. There are various theories about its function, but if the proboscis were purely functional there would be little or no difference between the sexes. 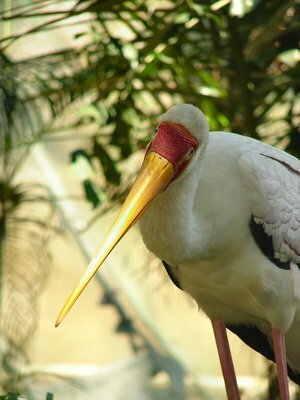 As it is, the males have the big schnozzles, the females little retroussé numbers. Older males even have to lift the nose out of the way to eat, so it is certainly a hindrance. It must be sexual selection: the girls like big noses, so they get them, and they have sons with big noses and daughters with the genes for big noses. The nose also turns red when the possessor is excited or angry. 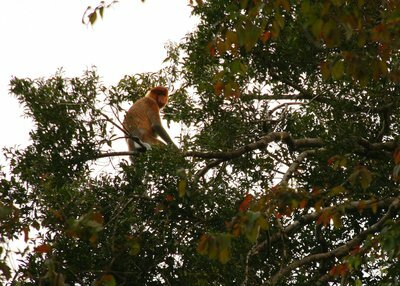 There are two groups of proboscis monkeys in the Kinabatangan Wildlife Sanctuary. One is a harem, with a dominant male, several females and their offspring. The other is a group of sexually mature bachelor males who sometimes try to sneak into the other group for hit-and-run quickies. When a bachelor male successfully challenges the dominant male and takes over mating rights, he will kill all the existing offspring. From the perspective of the selfish gene it is adaptive behaviour. Since the one who can beat up the rest takes all, the males grow to be much larger than the females, weighing up to 24 kg. Females weigh half that. The males are priapic. It is difficult not to notice, since their skinny carrot-shaped monkeyhoods are bubble-gum pink. We saw some squabbling in one group and it was horrible. Along with a lot of loud screaming we saw a monkey fall twenty feet or so through the trees. 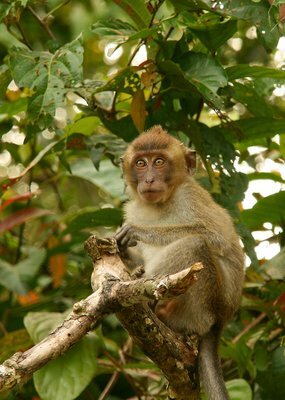 The other primates of Borneo include apes (the Bornean gibbon and Homo sapiens); other monkeys (the langurs and macaques); and prosimians (the western tarsier and slow loris). The leaf monkeys, or langurs, look somewhat like macaques, but their tails are longer, and so is their fur. They eat leaves alone. 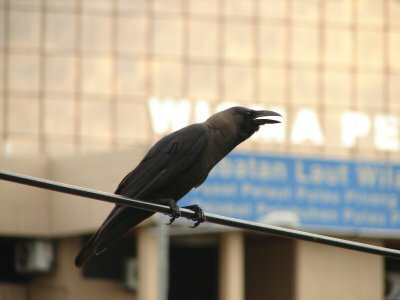 There are four species in Sabah. They live in harems of five to eight. The commonest two species are silver and maroon. You don’t get to see gibbons – they are very shy – but you can hear them. Around six in the morning they whoop loudly. They are badly affected by logging, since they are entirely arboreal. You don’t get to see tarsiers or lorises either, since they are nocturnal. Both have huge eyes. The western tarsier lives in small groups. It is tiny and jumps from tree to tree like a frog. 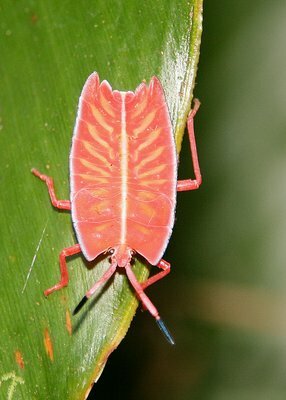 It eats insects. They say it has the ears of a bat, the eye of an owl and the tail of a rat. Lorises are unbelievably slow, like sloths, although they hunt insects as well as eating fruit. They just wait for prey to approach before grabbing it. They have short tails and are the size of cats. Another animal in deep trouble in Borneo is the Sumatran rhinoceros, Dicerorhinus sumatrensis. The rhinos stand 120 to 135 cm high and weigh up to 730 kg. 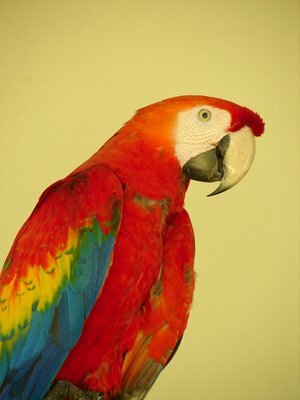 There are thought to be between 250 and 400 in the wild, in Borneo, Sumatra, peninsular Malaysia and perhaps Burma. We didn’t see any. 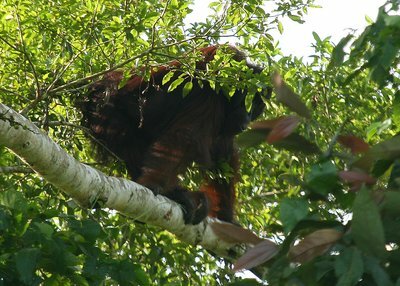 There may be only thirty of the Bornean sub-species left in the wild. 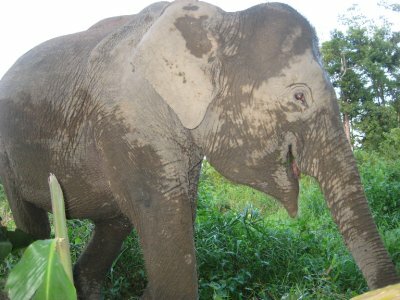 There are several in captivity at Sepilok and at Cincinnati Zoo. At Sepilok the male and female are kept apart except when the female is in oestrus. They have never bred successfully in captivity; the females get pregnant all right, but they always miscarry. As its Linnaean name implies, it has two horns. The horn of the Sumatran rhino fetches huge prices among those who believe that this lump of keratin – the same substance as hair or fingernail - will stiffen their marshmallows. The Asian product can sell for as much as $60,000 a kilo. African rhino horn is much less sought after. 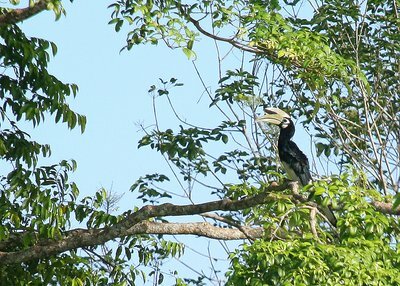 Hornbills, on the other hand, don’t have horns, but solid casques instead. There are 57 varieties, and eight in Borneo. They tend to be black or brown, with long tails, and they are big birds. 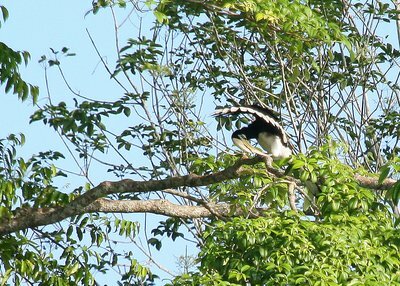 In the Kinabatangan we saw plenty of oriental pied hornbills (Anthrococeros coronatus), which grow to 75 cm. Their eyes appear to be glued on, like the eyes of soft toys. We saw some sitting near an eagle, and they were larger than their neighbour. 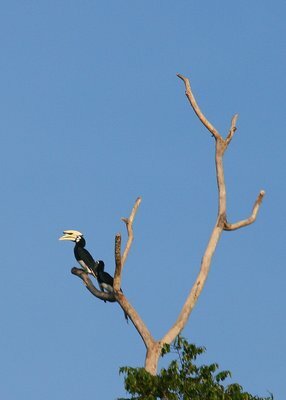 Hornbills nest in tree holes. 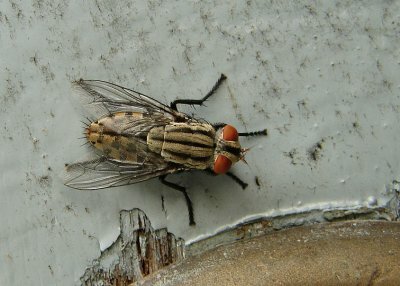 When the female is about to lay, the male walls her in, leaving only a slit. She stays there with her chicks until they are ready to fly. The male feeds them through the slit. 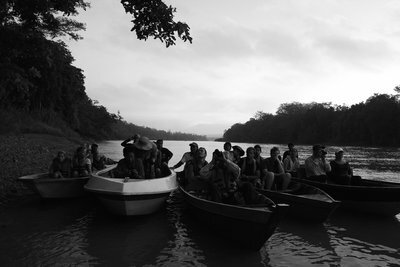 Our various excellent guides – Kai, Luis, and the lovely Nelly - spotted about five crocodiles. I only saw one, because they lie almost entirely submerged, and the remainder disappears as the boat approaches. They are estuarine crocs, also known as saltwater crocs, and in Australia they are known as vicious bastards and fast. But here, like the eagles, they mainly subsist on small animals, only occasionally attacking humans. Borneo is in fact right in the middle of their notional range, although sightings are now very rare in Thailand and Indochina. In New Guinea and Australia their populations have recovered to precolonial health, and they are also common in Orissa, in northeast India. Naturally, there are monitors too, usually resting on branches. 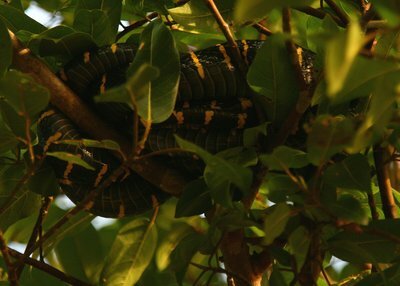 On one river cruise we saw a mangrove snake coiled in a branch overhanging the water. These are poisonous, but very lazy, or so it appeared. 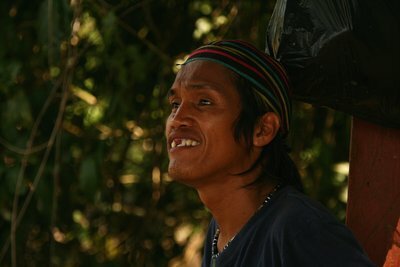 Kai is an orang sungai – from a river tribe. Partly because his teeth are filed, his face has an air of gleeful piratical wickedness, at odds with his character. As in, say, Papua, the river people speak a lot of different dialects and cannot understand each other. But they are all counted as Dusun, and all nominally Muslim. 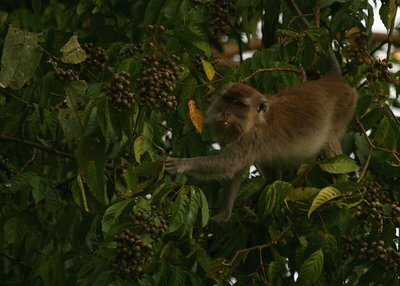 The commonest monkey in the sanctuary is the long-tailed macaque, Macaca fascicularis. It eats shoots and leaves (sic). It also eats small animals, and in the mangroves it eats crabs. It does so by inserting its tail into a crab hole, waiting for the crab to grab, slowly withdrawing the tail, and then dashing the crab against a rock. It lives in large groups and is highly sociable. It used to be a favourite subject of animal experiments. 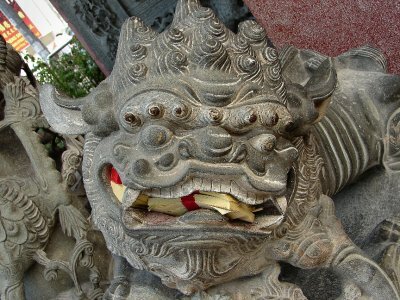 I have seen them all over the place in Asia and have grown to dislike the thieving hooligans. Each evening after supper we would go for a walk with torches. It was very creepy. But for the torches, darkness is absolute. My LED torch is fine for reading but inadequate for walking, especially with steamed-up glasses. It is still very hot and humid at night, and walking is very sweaty work. On the first couple of walks we saw plenty of elephant dung but no elephants (more on the elephants another time). All we saw was a couple of large scorpions. It was very muddy – you had to be careful not to leave shoes behind. Each time we walk we wear leech socks. These are not recognisably socks, but canvas Christmas stockings instead. The leeches are smaller than I expected, about an inch long, more like inchworms than slugs. They sit on trunks and leaves and stretch out when they sense traffic passing. They look like the letter-forming aliens from Charlie and the Great Glass Elevator. On one night walk we found a kingfisher sleeping on a branch. It was not disturbed by the torches or by the noise. 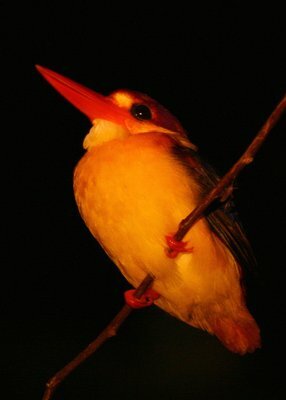 It may be a stork-billed kingfisher, but I am guessing it is a black-capped kingfisher, because of its smaller stature and shorter tail. After each night walk we head straight to bed, no hanging around the bar swapping war stories. We are up for a dawn boat ride at six each morning. Inside the hut, a million ants and mosquitoes and the odd gecko. From my hut at night I could hear jungle noises, which often seemed to be nearby. There are Chihuahua barks and growls outside. It’s not a Chihuahua. A frog? A monkey? No idea. And in the morning, you wake to the melodious song of tailor birds. 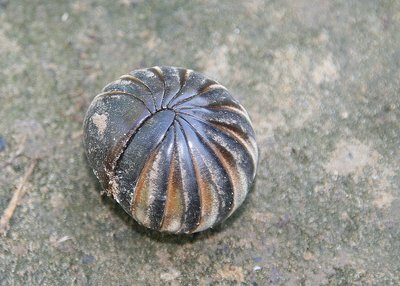 This is a millipede commonly found in the area, a kind of pill millipede. If disturbed it rolls up into a ball for a few minutes. Threatened millipedes curl up; threatened centipedes run away, because they are much faster. 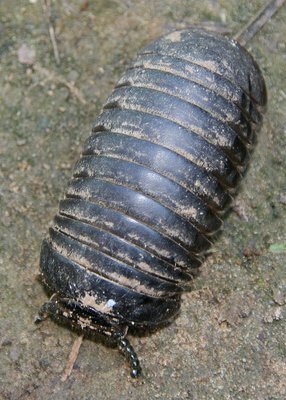 (They only have one pair of legs per body segment, while millipedes have two.) Centipedes can run, proportionately to body length, faster than cheetahs. I’m back in the northern hemisphere in order to get a new Indonesian visa. The rainy season seems to have begun in Kuala Lumpur. I am predictably suffering from culture shock after Nusa Tenggara. My room has a flush toilet, a shower with hot water, a basin and a television. I have eaten roti canai twice in my 16 hours here: bliss! (On the other hand, the coffee is sadly inferior.) What has struck me most, though, is that nearly everyone around here is speaking Indian, Chinese or Arab languages. There’s not much point trying to speak Malay to someone who speaks English just as proficiently. In the UK, consumption and aggregate demand display a strongly seasonal shape. There is a sharp peak in the fourth quarter, due to Christmas spending, and then a sharp dip in the first quarter, while the second and third quarters are in the middle. This is why the GDP growth figures you see have to be seasonally adjusted. In Indonesia there is a similar pattern, if you filter by lunar years. Demand for goods and services rises sharply during Ramadhan, and prices rise accordingly. By law, workers receive an annual bonus at Idul Fitri. Despite the fact that it is a month of fasting, Indonesians spend more on food than at any time of the year. This is because they are buying fancier food with which to break the fast (buka puasa), and because prices are higher, but also because people eat more. This may be due to the blowout at Idul Fitri, but restaurants are very busy throughout the month. Even with price hikes, supply cannot always meet demand. Last year there was unfulfilled demand for sugar and cooking oil. Right now there is a problem with LPG supplies. The government has introduced a programme to convert kerosene to LPG throughout the country. Pertamina, the state petrol company, cannot keep up. Price data, as at end August: inflation 11.85% year on year, 9.28% year to date. The Bank Indonesia base rate is 9%, which is a negative real interest rate. One good reason to come to KL is to buy books. In Indonesia I have started to encounter the book famines that I feared all along. In Malaysia and Indonesia at least half of the retail space of a bookshop is devoted to wealth and how to acquire it: business, economics, sukses books. A surprising portion of the residue is devoted to electronic Korans. In Kuala Terrengganu the few English books available were thrillers and romance only, and I made do with a couple by Martin Cruz Smith, which turned out to be very good. In Solo, on the other hand, there were six books, all Penguin Popular Classics. Vanity Fair, William Makepeace Thackeray. A nice mix of acid and sugar. Voice of the Violin (in English), Andrea Camilleri. One of the Commissario Montalbano series, comic, brilliant and best-selling detective procedurals, which have also been well adapted for Italian television. Well translated into American English. Pourquoi j’ai mangé mon père, Roy Lewis. Given to me by Cesar in Lewoleba. The original English edition is What we Did to Father (the French title rather gives it away). Very funny. 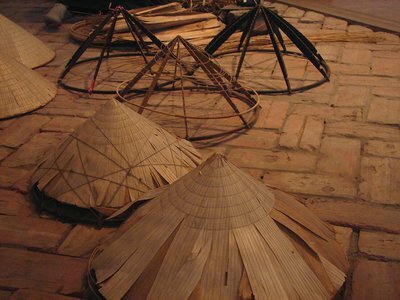 How to make a Vietnamese hat: take some green Latania (latan palm) leaves and spread them out in the sun. Leave for two or three days. When they are white, spread them on the ground to soften. Iron out the creases with a heated ploughshare. Construct 16 bamboo hoops of varying sizes. Take the biggest, and attach eight or ten bamboo sticks to the rim, so that it forms a cone. Drape the other bamboo hoops on the cone. Stitch the leaves on to the cone. Reheat the hat over burnt sulphur to whiten the hat and prevent mould. Naturally, you should not do this unless you have grown up in a village that specialises in hatmaking.